Rooftops and parking lots at airports are some of the facilities that are not multi-purpose, but at Kuala Lumpur International Airport these 'idle' spaces have been transformed into a clean energy generation facility - namely solar power. That's cool because it demonstrates the corporate sector's support towards the Government's initiative in introducing renewable energy and in the process reduce carbon footprint. The interesting part is that Malaysia Airport did not have to dig into its own pocket to finance the project. They rent those idle spaces out to someone who is willing to invest - to SunEdison. The international company must've seen the great potential in renting the airport's rooftops and parking lots for them to take the bold move to invest RM200 million (about US$60 million) there. 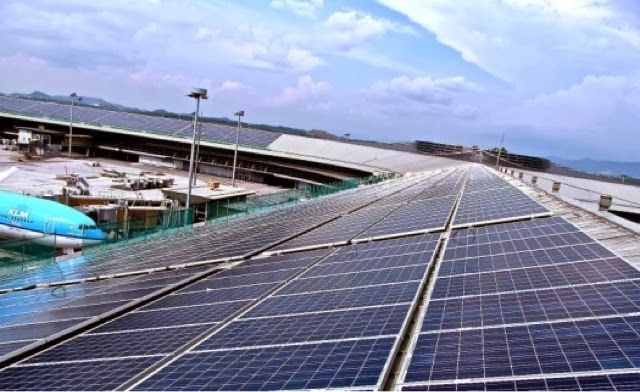 Malaysia Airports Holdings Bhd (MAHB) and SunEdison have jointly launched Malaysia's first airport solar power system at the Kuala Lumpur International Airport with a total investment of RM200 million. According to MAHB chief operating officer Datuk Abdul Hamid Mohd Ali, the solar power system is expected to save the airport about RM2.1 million annually based on its current energy costs. The 19 MW direct current (DC) system was the largest in Malaysia where it interconnected and combined ground-mount (5MW), parking canopy (10MW) and roof-top (4MW) systems. "We don't incur any cost for this project because we provide the under-utilised asset, while SunEdison is required to pay lease rental and royalty to us. In return, we buy the electricity at a much cheaper rate," said Abdul Hamid. MAHB is looking to expand this system at its other airports especially at the short take-off and landing ports (STOL Ports) located in remote areas. "Solar energy is one of the areas that we are seriously looking into. We may discuss with SunEdison further on the system for the other airports especially in Sabah and Sarawak," he said. Solar technology manufacturer and provider of solar energy services, SunEdison is the Feed-in-Tariff (FiT) approval holder, granted by SEDA Malaysia. The company is allowed to sell power generated from renewable energy sources to Tenaga Nasional Bhd for a fixed period of time. "There is an excellent Feed-in-Tariff programme in Malaysia and we are looking forward to help additional airports in Malaysia and around the world," said SunEdison president for Asia, Middle East, South Africa and Australia, Pashupathy Gopalan. This sounds like a negotiated quota. If indeed Malaysia Airport can get other airports in this country installed with solar PV granted by SEDA, and enjoy the current FiT rate, it is a clear act of depriving others in the 'open bidding' system.